A woman holds a sign as other protesters gather outside the Nigeria House in London April 14, 2015, to mark the one-year anniversary since a group of Nigerian schoolgirls were abducted in Nigeria. Nigeria’s military tweeted Tuesday, announcing that it had rescued approximately 300 women and girls who were kidnapped by Boko Haram. 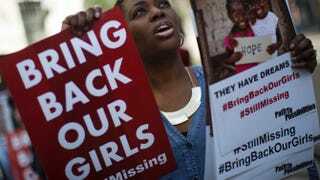 Although the rescue occurred, it is not certain if the nearly 300 abducted schoolgirls abducted by the Islamist group last April were among those rescued, CNN reports. A military representative said that the rescued victims are being questioned and identified, and none have been in communication with their family members as of yet. The news comes nearly a year after the Islamist extremist group captured global headlines by kidnapping nearly 300 girls from their boarding school in Chibok, Nigeria. Many of the girls were reportedly sexually abused and forced to convert to Islam and marry their abductors. The social media hashtag #BringBackOurGirls was used by protesters and sympathizers all over the world as a way to bring attention to the kidnapping, and to compel local and global authorities to bolster their efforts to rescue the schoolgirls. The rescue also comes nearly a month after Nigerian President Jonathan Goodluck lost the presidential election to President-elect Muhammadu Buhari. It was a historic transition because it’s the first time in Nigeria’s history that a presidential candidate who is not in power emerged victorious in a democratic election. According to the CNN report, information about the abducted schoolgirls has been “spotty and inconsistent,” with Nigerian officials giving conflicting reports about the nature of their rescue efforts.